As a rider, you’re guaranteed to have fresh treats on hand for your equine companion—the most popular being carrots. But don’t feel left out in the produce department. If you’ve got a few carrots to spare, turn to this tart-sweet dish for a fresh Southern take on the classic spinach salad. scooping grain, it’s nearly impossible to mess this one up. Preheat oven to 375 degrees F. Line baking sheet with foil or parchment paper and grease liner. To make honey-bourbon glaze, combine all ingredients in bowl, whisk and set aside. Assemble rosemary-lime dressing ingredients in jar, shake well to combine and set aside. Cut carrots in half lengthwise and arrange on baking sheet with bacon, alternating between veggie and meat. Whisk glaze—the sugar will not be completely dissolved—and drizzle over bacon and carrots, using spoon or basting brush to scrape out sugar and coat toppings thoroughly. Sprinkle with rosemary, and place in oven on middle rack. Cook for 15 to 20 minutes or until carrots can be just pierced with fork (not mushy) and bacon is browned. Remove from oven and set aside. Place spinach on large plate. Roughly chop bacon—it’s too sticky to crumble—and sprinkle on spinach. 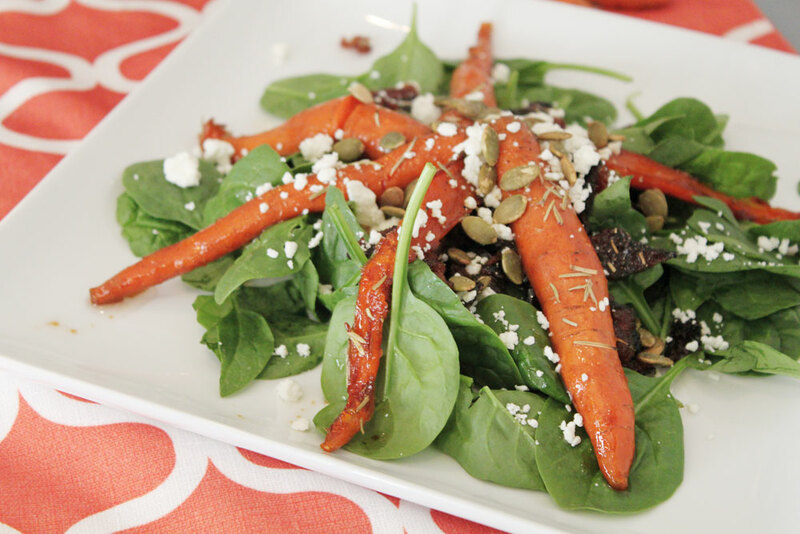 Place carrots in star pattern and top with goat cheese crumbles and pumpkin seeds. Finish by shaking dressing and drizzling desired amount onto salad.